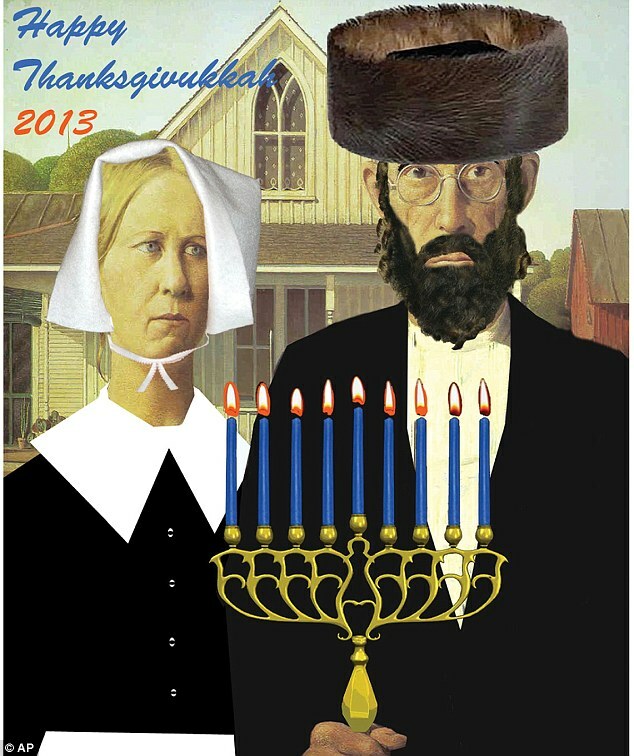 Thanksgiving in the USA coincides with Hanukkah this year..
A time for reflection and thankfulness. The miracle of the Hebrew Nation is being celebrated, starting today, on Thanksgiving Day for the USA. We are grateful for the freedoms we sometimes take for granted. Blessed to be living a mostly comfortable life here. But we know that in many parts of the world today, there is oppression and strife. Those of us Americans who complain about our circumstances, need to consider the plight of other countries and what they are enduring. And of course, what has happened in the past,the horrible parts of the worlds history should not be forgotten. It can and has repeated itself. So for all who celebrate Hanukkah and for those in the USA, lets give thanks to God for this country and for miracles. Never forget, and yet, so many have. The atrocities of WWII and the Holocaust are slowly becoming a mere ‘one’ chapter mention in many of the latest school textbooks. History is being rewritten it appears, to accommodate the ‘politically correct’ and those who want to keep societies heads in the sand. We all know that those who deny or ignore the true facts of what has occurred in the past , that horrific history, may be repeated if we don’t learn from it. To those who have had to live through any genocide ( or still do ), government lead or otherwise, they need their voices heard now, before they are no longer alive to tell their stories. Stories of first hand persecution, of the lives lost, of the horrors of what other fellow humans have done to them because of their religion, race, color or beliefs. There are many people groups to this day that are victims to hate crimes. From all across the globe and in our own towns. Thankfully our family has never had to endure any atrocities as some of our distant ancestors may have. Right now we are honored to be volunteering and helping a Jewish man who lived through and survived the Holocaust. Through multiple miracles, Jay Ipson and his parents escaped a Lithuanian Ghetto and hid for 9 months from the German Nazi’s and their own countrymen. For 6 of those 9 months, Jay and his parents and 10 other Jews hid underground in a potato hole. A Polish Christian family risked their own lives and protected them on their farm. Jay Ipson lives now in Virginia and teaches Holocaust History ( and at the time of this writing , his mother Eta is still alive, 102 years old! ) His story of survival is portrayed at the Richmond Holocaust Museum, a museum that Mr. Ipson co-founded. Virginia Holocaust Museum. His family saga is told in the book ‘Izzy’s Fire’ About “Izzy’s Fire” | Nancy Wright Beasley. 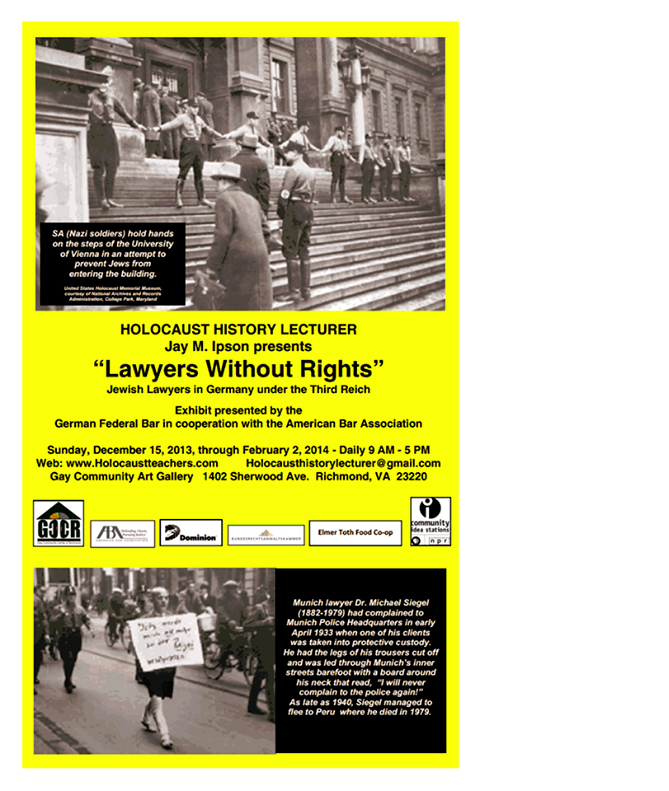 An exhibit is coming to Richmond, Virginia, USA that presents the stories of all of the Jewish lawyers who’s right to practice law was taken from them. Jay Ipson’s father, Israel Ip ( Izzy) was an attorney in Europe at the time and was denied the right to continue his profession. Due to his being so smart and desperately wanting to protect his family, he told a German soldier, when questioned on what his occupation was, that he was “a mechanic”. Through a sequence of events, Israel Ips quick thinking and an adjustable wrench helped save his family. Eventually Jay with his mother and father, came to the USA to live in freedom. 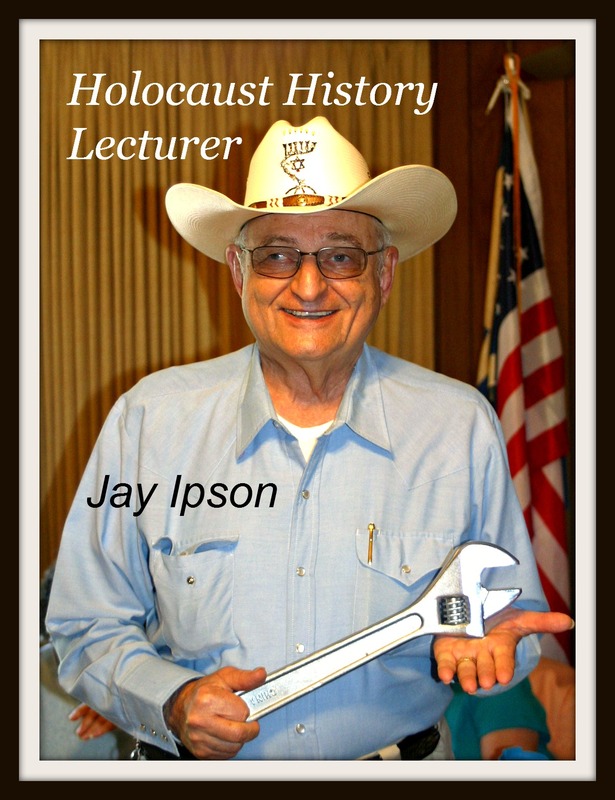 To learn more, check in with Jay Ipson’s website: Holocaust Teacher. It is currently under construction, but check in when you can to find out if Jay will be lecturing in your area, or contact him if you would like him to visit and teach your group or class. Shalom, peace, may God bless us all.